There is something very, very wrong about this. I can't put my finger on it, but .... oh wait. YES I CAN. This wardrobe contraption makes it appear as though this woman with no facial fat is 9 months pregnant with a child whose head has managed to break through her uterus and skin to poke its precious, grinning face through a conveniently placed hole in a royal blue velour mock-T vest. IN FRONT OF A FAUX-PAINTED FALL-THEMED BACKGROUND. It's totally awesome. How could you NOT want one? That is so hideous I'm still laughing. How god awful ugly. LOL>.....I pray no one ever buys me one of those. I'm seriously cracking up. Rachel, I couldn't agree more! Ick! 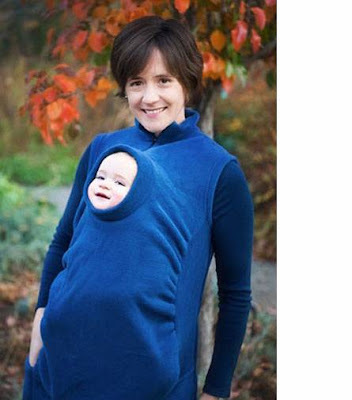 It's sort of like a Slanket or a Snuggie, but with a baby inside. Michele, NO KIDDING! It totally freaked me out. LOL. This is Hilarious! Is it for real?! Angie, I have no idea ... my sister just sent me the picture. It's one of those things that LOOKS like it might be real, but I can't imagine who would sell that! OKAY SO THAT'S JUST WEIRD!! I'm seriously laughing so hard I could cry! I mean it....I think I'm gonna have to repost this on my blog...and your description! Priceless!!! Megan, you can't IMAGINE how astounded I was on Saturday to realize that one of those would actually have come in handy on that chilly morning! Not quite sure how I ended up here. But this is hilarious! Oh and Hi and I love your blog. Oh, MY! I got here through a link on my friend Megan's blog and really the only thing I can say is OH MY! Except for the part where I say that looks like a cuter version of one of those Discovery Health specials about a parasitic twin. Cuter, but infinitely more disturbing.